SATRA has recently taken part in a number of events which were designed for very different delegates. The first of SATRA’s new breakfast seminars were held at the beginning of the month – one in Leicester and the other in London. 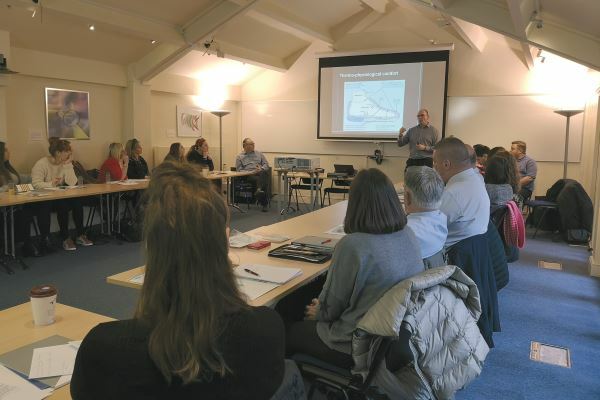 These events allowed delegates to meet members of the SATRA team and also hear short presentations on a number of key topics that had previously been identified as interesting subjects by the delegates themselves. The topics selected for consideration – ‘fitting and comfort’, and ‘customer complaints’ – were both popular subjects, as the sessions were fully booked, with a mix of retail and manufacturer company representatives attending on both mornings. James Corton of SATRA’s membership team opened with a presentation on the history of SATRA and its services. He was followed by footwear expert Lee Wilson, who outlined the importance of footwear and fitting, and Darren Roberts (head of SATRA’s footwear testing team), who explained ways to manage consumer complaints and the importance of due diligence testing. The relaxed atmosphere at both seminars allowed delegates to freely ask questions and discuss the issues raised with the SATRA team members and fellow attendees. Following the success of these events and the positive feedback received, we plan to host more breakfast seminars in the future. We want to cover issues that are of concern to the industry, so would be pleased to receive suggestions about what to cover in forthcoming events. Email footwear@satra.com if you have a particular subject that you would like us to discuss. Another popular event in during which SATRA shared was called ‘The Big Bang Northants’ – one of a series of scientific events for school children offering hands-on activities, interactive workshops, theatre shows and opportunities to talk to scientists and engineers from local and national companies all over the UK. This year’s Northamptonshire show was held at the world-famous Silverstone Grand Prix circuit. The event played host to over 3,000 visitors, who met representatives from a wide variety of exhibitors based in and around Northamptonshire. The fair also featured workshops and shows for visitors to benefit from what was described as ‘a fully interactive science, technology, engineering and mathematics (‘STEM’) experience’. 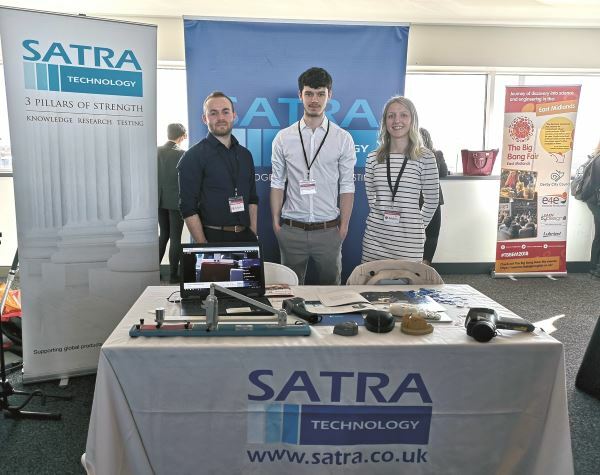 SATRA’s Adam Kay, Edward Pratt and Hannah Boughey met many young people at The Big Bang Northants, and reported that they were inquisitive about scientific activities at SATRA. We hope that what these youngsters saw demonstrated by Adam, Edward and Hannah has inspired some future scientists and engineers, and look forward to next year’s fair. The photograph at the top of this report shows one of the new SATRA breakfast seminars, which proved popular with delegates. This article was originally published on page 54 of the April 2019 issue of SATRA Bulletin.